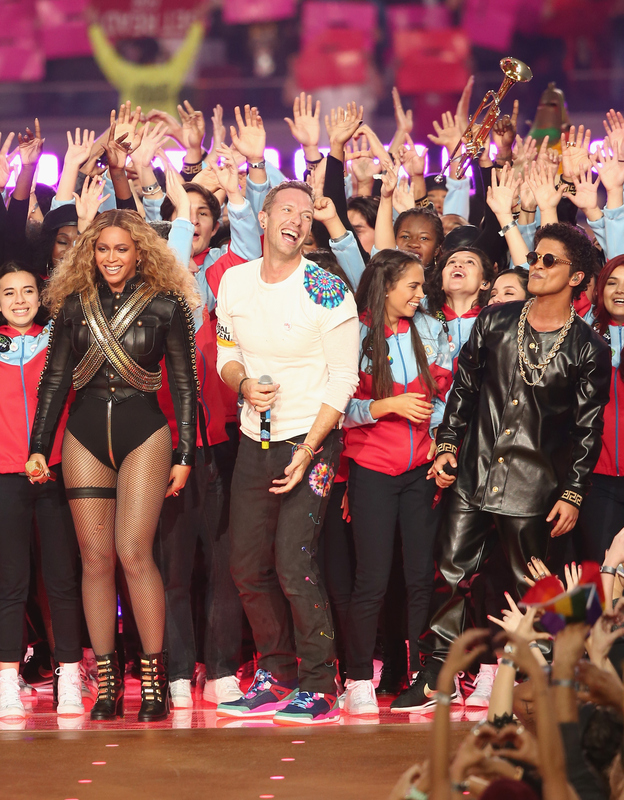 I'm sure we're all still trying to pull ourselves together after Beyoncé, Coldplay, and Bruno Mars' Super Bowl 50 halftime show pretty much won the night (no offense to the Broncos and Panthers). But what started out as a psychedelic, flower power-inspired set from Chris Martin and company soon became a musical throwback to past Super Bowl performers and artists who inspired the three co-headliners. First, Mars paid tribute to old school hip-hop in an all-black leather outfit and gold chains while making everyone at Levi's Stadium get up and dance to "Uptown Funk." His set then segued into the halftime show's most anticipated moment: Beyoncé debuting her new single "Formation." The pop superstar incorporated a military style ensemble to her electrifying performance. Jaws dropped as soon as she appeared in a black bodysuit with criss-crossing gold chains. Remind you of anyone? Thankfully, the video montage during Coldplay's closing song "Up & Up" flashed a series of past Super Bowl performances, starting with Michael Jackson's 1993 halftime show. The King of Pop's military jacket inspired Beyoncé's outfit, which was such a powerful image, made even more moving because of both superstars' legacies. The other performers shown in the montage included Bruce Springsteen, Katy Perry, Stevie Wonder, Paul McCartney, and James Brown. Let's examine Bey's outfit, shall we? I'm sure the King of Pop's presence was felt worldwide, thanks to another showstopping outfit and performance from Queen Bey.